Lemon Verbena Tea has antipyretic, antispasmodic, sedative and stomachic. Traditionally, Lemon Verbena Tea has been used to treat asthma, fever, colds, fever, flatulence, stomach upset and diarrhoea. 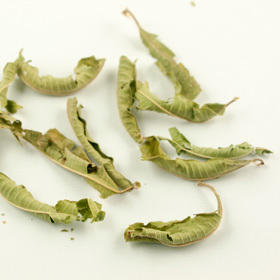 Lemon verbena tea is consumed for its relaxing effects. Besides that, Lemon verbena leaves are used to add a lemony flavour to fish and poultry dishes, vegetable marinades, salad dressings, jams and puddings. Pieces of dried green leaves. I have not received the order.